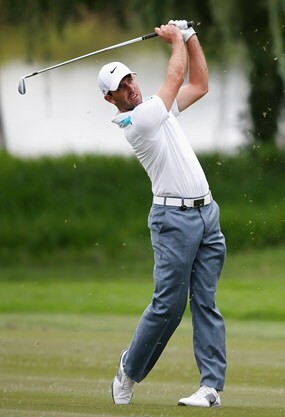 Famed South African Charl Schwartzel is scheduled to play at the Chiang Mai Golf Classic November 10 – 16, 2014 at Alpine Golf Resort Chiang Mai. The Chiang Mai Golf Classic is scheduled to be held from November 10 – 16, 2014 at the Alpine Golf Resort Chiang Mai in San Kamphaeng. Governor Suriya Prasatbuntitya announced the upcoming event at a press conference last week. The event which is being held by Chiang Mai Province together with the Chiang Mai Provincial Administration, PTT Public Co. Ltd and governmental and private agencies. The event will promote golf in Chiang Mai and the upper North internationally and give the province international exposure for potential investment. A commercial video has been made with each tennis star visiting major sites around the province and Lamphun including Charl Schwartzel visiting the San Kamphaeng OTOP Center, Kiradech Aphibarnrat at Wat Si Suphan and K.T. Km visiting Lamphun’s textile factories. Retired sports celelbrity Paradorn Srichapan also took part in the video visiting Wat Phra That Doi Kham. The Chiang Mai PAO will host the parties at the Hor Kham Luang Pavilion in Royal Park Ratchaphruek. The Chiang Mai Golf Classic offers US$750,000 prizes and is part of the Asia Tour. Alpine Golf is promising to shake things up with the addition of new bunkers to further challenge the players. The event was rescheduled from July, and Chiang Mai’s cool weather will go with the breathtaking views offered by the course. Designed by Ron M. Galr, it is nestled in a valley surrounded by the San Kamphaeng forests. The 2014/15 cricket season in Chiang Mai started on 1st October after a break of less than two months as a Chiang Mai Senior League XI took on Delia Memorial School, a touring side from Hong Kong who had visited last year and returned to Chiang Mai to prepare for their new season back at home. The boys from Hong Kong were playing a Select XI drawn from the teams that make up the Chiang Mai Senior League and the visitors proved too strong for the home side in the two 20-over matches that started their tour. Richard Cowles won the toss in the first match and chose to bat first on a sunny morning with the ground at Prem having made a remarkable recovery from a storm that had left the ground flooded only two days earlier. Openers, Tariq and Wani, were both undone by impressive opening bowler Waqas Khan and it was left to Martin Cardno to hold the innings together. The visitors found batting rather easier as opener Akbar Khan reached an unbeaten fifty and was given good support from Sheryar (23) and Waqas (21). Choo took a wicket as Chanchai took a good catch and Wani took a wicket with his first ball, but Chanchai was the most impressive bowler as he only conceded 16 from his four overs. Delia Memorial School recorded an eight-wicket victory with 3.4 overs to spare but the home side would have another chance in the afternoon when the second match got underway with Delia Memorial School winning the toss and electing to bat. The boys had changed their batting order but this only gave the chance to Sarfaraz Khan to open the innings and he played an excellent innings of 71 with 3 sixes and 9 fours. DMS looked on course for a big total but 14-year-old Nok came on to bowl and showed she was perfectly capable of bowling to the boys as she claimed four wickets for 23 and dismissed all three Khans, Sarfaraz, Akbar and Waqas, the leading players in the visiting team. She impressed the opposition, her team-mates and all who were watching including David Buck who runs the Cricket Academy at Prem and is a good judge of cricketing ability. Young Nok is one of the most promising juniors in the country and may soon get her chance with the Thailand women’s team. She also fielded well as she caught a catch and almost added a run out to her afternoon’s work but she could not prevent DMS reaching a useful total of 142 for 7. A position of 61 for six in the 10th over looked fairly terminal but somehow the home side stayed in the match as Bunchuai, pushing the singles, and Richard Cowles, finding the boundary added a fifty partnership for the seventh wicket. It has to be said that the home side were helped by a remarkable 49 extras with numerous wides and no balls from the boys but the match went into the last over. Cowles had just been bowled for 32 and neither Bunchuai nor Choo could hit the fours and sixes that would have taken the match to the wire. Delia Memorial School won by nine runs to gain their second victory of the day and the home side would need to raise their game in the Saturday’s 40-over match. Martin Cardno was determined that the Chiang Mai side made up almost exclusively of Chiang Mai Lanna CC members and their juniors would win the third and final match of Delia Memorial School’s tour, The side representing the Chiang Mai Senior League looked to be coasting to victory as Cardno and Wani both played some fine attacking shots as the home side reached 171 for 3 but Cardno having just completed his fifty called his partner through for a risky single and the direct hit that ended Wani’s innings on 34 looked to have changed the course of the match. Earlier in the day when DMS had won the toss and chosen to bat first they had looked to be on course for a big total in perfect conditions at the Prem Oval as Shakir and Waqas produced a century partnership for the second wicket. They were made to work hard by some very tidy seam bowling from Ismail, Johnson and 16-year-old Chanchai. The boys from Hong Kong had looked on course for a total close to 250 but a target of 208 remained within the home side’s reach and they were given the perfect start by their openers and Martin Cardno was able to play the match-winning innings. Chiang Mai cricket had again given a good account of itself against a touring side who already have asked to make another visit next year and it was encouraging for local cricket that the juniors had done so well and that two new recruits had played their parts in a very satisfying victory for the home side. Chiang Rai native Butsabakorn Sukpan returned home to a hero’s welcome after winning the gold medal in golf in the 17th Asian Games in Incheon, South Korea. She was awarded a certificate by the government, prize money and a victory jacket by Pongsak Wangsamer, Chiang Rai Governor who was joined by Bussarin Worapattananan, President of Chiang Rai PAO, Amorn Aryupan, Director of Sports Authority of Thailand Chiang Rai Province Center, and government and private officer and Chiang Rai residents as she arrived at the King Mengrai Monument on October 7, 2014. The golfer is the daughter of Arkom Sukpan, Muang Chiang Mai District Chief Officer and his wife Kannika. Thailand came in sixth with 12 gold medals, 7 silver medals, 28 bronze medals, for a total 47 medals.